She cost NY $25,000, but looks like she may have gotten her boyfriend one? So, in case you hadn’t already heard, Alexandria Ocasio-Cortez is once again the center of attention, and it’s once again for something that doesn’t make her look good. 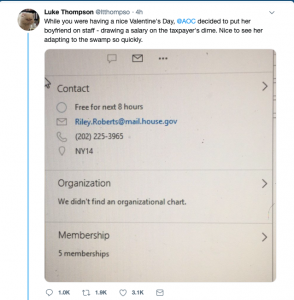 See, National Review contributor and podcast cohost Luke Thompson has done a little digging, and he’s learned that AOC’s boyfriend Riley Roberts has a House.gov email address. How do you like that?